But what if there really was a zombie apocalypse someday? A shotgun would surely be on your survival list. Maybe even a flamethrower. But what's the biggest tool you can have in your arsenal to combat hordes of zombies? 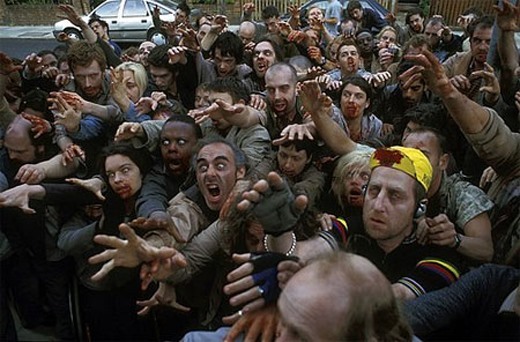 In films like 28 Days Later, Night of the Living Dead, Dawn of the Dead, Return of the Living Dead, City of the Living Dead... (you get the picture)... zombies all have a similar problem. A taste for brains. But that's not all. They walking dead suffer from a condition called Consciousness Deficit Hypoactivity Disorder (CDHD). Neuroscientists Bradley Voytek and Timothy Verstynen from UC Berkeley explain CDHD as "the loss of rational, voluntary and conscious behavior replaced by delusional/impulsive aggression, stimulus-driven attention, the inability to coordinate motor-linguistic behaviors and an insatiable appetite for human flesh." And to help combat against those infected with CDHD, Voytek and Verstynen helped design the handy "Science of Surviving the Zombie Apocalypse" infographic seen below, thanks to their extensive research scanning the zombie brain. And yes—these are real scientists. "This entire endeavor is partly an academic 'what if' exercise for us and partly a tongue-in-cheek critique of the methods of our profession of cognitive neuroscience," Verstynen said. The brain scans above show a significant loss of brain tissue in the undead. And from a theoretical neuroscience approach, a zombie's weakness can be found. Hence, knowledge of what actions to take to avoid become the walking dead yourself. Run fast to escape their poor motor skills and take advantage of their amnesia by hiding until they forget about you. Or mimic a zombie (like in Shaun of the Dead) to activate their Capgras delusions. Or try distracting them (zombies have a hard time focusing on more than one thing). Voytek is also on the board of the Zombie Research Society when he's not doing actual neuroscience work on strokes and memory. Other scientists are on the board, as well as the man who started it all—George A. Romero. If you want to become a member, you can, but you have to buy a tee-shirt first. To learn more, watch Voytek talk about the lust for human flesh in the video presentation below. I did not really care for that,no offense though. Just not my cup of tea.